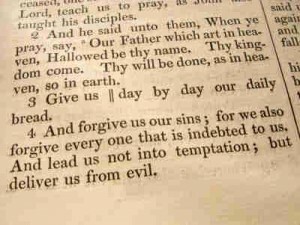 The Lord’s Prayer may be the most familiar prayer that exists. It is found in the Bible, in Matthew and in Luke, and came from the very mouth of Jesus Christ. This prayer is actually instructional; it is a model prayer that is meant to teach us the correct focus and emphasis of prayer. Although it is commonly called ‘The Lord’s Prayer’, it should more correctly be called ‘The Disciples’ Prayer’ because it is meant as a model prayer for those who follow Jesus. We find Matthew’s recounting of Jesus’ delivery of the Lord’s Prayer set amidst Jesus’ teachings against hypocritical religious acting. Jesus was contrasting the way the false religious leaders acted with how true followers of God should behave. Jesus had cautioned His disciples not to call attention to themselves in prideful ways when they went about living out their faith. He said that the false religious teachers like to call attention to themselves, instead of pointing to God, when they did things like giving to the needy (Matthew 6:2-4) or praying (Matthew 6:5-8). After Jesus had finished describing the wrong way to pray, He illustrated the right way to pray by using this model prayer. Of course, if this prayer is simply memorized and repeated without a heartfelt commitment and earnest sincerity, it becomes the same sort of hypocritical mumbling that Jesus had just condemned. This prayer was never meant to be mimicked; it was to serve as an outline, or guide, for the sincere devotee to God. As we will see, this prayer requires an honest love for God on the part of the one praying for it to be anything more than a superstitious poem that will not even reach the ceiling. Jesus had railed against the false religiosity of the Pharisees and Sadducees. He had pointed out that they do their religious duties for selfish reasons, to steal the glory that rightfully belongs to God for themselves, not out of love and service to Him. How often do we do the same thing today? How many times do we do something good for someone simply to make ourselves look good? Rather, we should be doing everything for Jesus’ sake; out of love for Him and for His glory and honor. This phrase recognizes our allegiance to God. He is our Father; He created us, He sustains us, He gives us spiritual life. Everything we have and everything we are or ever hope to be, we owe to Him. The all-powerful Creator, Who lives outside of time and space, in the realm we call ‘Heaven’, is our Father, our God, our life, and our Savior. When we pray, we must be aware of exactly Who it is to Whom we are praying. “Those who pray like this are members of a family, and they look to God as the Head of the family, one who is bound to them by ties of love” (Baker, vol. II, p. 1350). In Jesus’ day, a person’s name was indicative of his character. This phrase [“hallowed be your name”] means that we realize, and acknowledge, that God is holy, “Holy, holy, holy is the Lord of hosts; the whole earth is full of his glory!” (Isaiah 6:3 ESV). There are too many people these days who think too little on God’s holiness. We do not realize that God is perfect, He is our Creator, He sustains us, and He deserves our worship and love. Too often, we do not approach Him with the reverential awe, or fear, that the Bible commands, “The fear of the LORD leads to life, and whoever has it rests satisfied; he will not be visited by harm” (Proverbs 19:23 ESV). This phase means that we should want God’s plan to be carried out by humans on earth the same way it is carried out by the angels in Heaven. As believers, our hearts should be set on furthering His Kingdom any way that He asks of us. We should be agents of change, whose mission is to share the good news of God’s love for humanity with all those we can, so that this world would be more like His Kingdom. “The servant of God looks for the rule of God to become actual in more and more lives” (Baker, vol. II, p. 1350). The believer should be living in a daily dependence on God’s provision. After Jesus had told His followers that they need not worry about having the necessities of life, He said, “But seek first the kingdom of God and his righteousness, and all these things will be added to you” (Matthew 6:33 ESV). “…the prayer is for the simple and present necessities of life. Jesus is counseling his followers to pray for necessities, not luxuries, and for what is needed now, not a great store for many days to come. By confining the petition to present needs Jesus teaches a day-by-day dependence on God” (Baker, vol. II, p. 1351). Because we are believers in Jesus Christ, our sins are forgiven. Therefore, this is not saying that our sins are forgiven because we forgive others. Rather, we forgive others because we have been forgiven. It is easy to forgive others when we truly understand how much God has forgiven us. If we claim to have had our sins forgiven by God, yet we refuse to forgive others, there is a problem with our relationship with God, and that problem needs to be dealt with. We know that God does not tempt anyone with evil (James 1:13). Therefore, this phrase must be a request for God to guide our paths away from temptation and testing. It is a request for protection against that which might cause us to fall into sin. The Bible tells us that everything that happens is either caused by God, or God allows it. As such, we believers realize that God is in control of every second of our lives, so we pray for God to guide our steps away from temptation and towards holiness. God is the only one Who can protect us from evil [alternate translation: evil one]. It is by His strength that we are enabled to stand against the world, the flesh, and the devil. “Submit yourselves therefore to God. Resist the devil, and he will flee from you” (James 4:7 ESV). The Bible also tells us that God will not let us be tempted or tested more than He will also supply the ability for us to endure, “No temptation has overtaken you that is not common to man. God is faithful, and he will not let you be tempted beyond your ability, but with the temptation he will also provide the way of escape, that you may be able to endure it” (I Corinthians 10:13 ESV). When we pray to God, we must understand that He is the Holy Creator, and Sustainer, of the universe. Our basic motivation in prayer must be for His glory and the furtherance of His Kingdom. We can surely ask Him to supply our needs and comfort our afflictions, but we must always recognize that His will trumps ours. We should desire that His will be done here on earth, and we should be willing to submit to His plan, rather than expect Him to submit to ours. We must always remember that every good thing comes from God (James 1:17); He lovingly supplies our needs. We must forgive others as we have been forgiven. We must trust God to deliver us from any temptation or testing that we should encounter, knowing that we are unable to resist temptation on our own. When we pray with this attitude, we can say with the apostle John, “And this is the confidence that we have toward him, that if we ask anything according to his will he hears us” (I John 5:14 ESV). Baker Encyclopedia of the Bible. Walter A. Elwell, ed. Baker Book House, 1988. Our beautiful Lord and Savior speaks through you with such GRACE. Thank you and,have a wonderful day. I so agree with Christine’s comment Robert. You put this together in such an intelligent way that it is hard to not grow in knowledge about the content and the context of the Lord’s Prayer. Well done. I like to always read your articles for they allow me to dig deeper into the knowledge of God. You have the gift of teaching. Thank you for the article about the Lord’s Prayer. The insight provided with the cross references to other scriptures was especially helpful in helping to broaden the understanding of the prayer. Wonderful, wonderful, wonderful article, Robert!! I have always loved praying the Lord’s Prayer (or as you call it, the Disciples’ Prayer.) Surely the Holy Spirit dwells within you while writing! The Lord’s Prayer was given to His disciples as a way to pray ‘pre-cross’. His blood had not yet been shed for the sins of all men. To make this prayer ‘our prayer’ is to ignore its original purpose. That is why the author of this article has had to redefine and redirect its meanings. If I, as a believer in Christ, do not forgive another who sins against me, my sins are still forgiven by grace ‘not of works’. Hello Mr. Degler. Your assumption that since Jesus blood was not yet shed, we should ignore this prayer and so I believe you have a big misunderstanding about the cross. I suggest you find a study Bible to see where and why you are in error sir.